God gets ready and god comes; we wait! Copernicus. Nikolaus Copernicus. Mathematician. Astronomer. It was Copernicus who came up with the idea that it’s the sun – not the earth – at the center of it all. That much, we know. What we don’t often hear about is that Copernicus was a contemporary of Martin Luther. About the time Luther was ordered to the university in Wittenberg, Copernicus was beginning to outline his theory of the universe. Shortly after the confession was presented to the emperor at Augsburg, Copernicus was finishing his manuscript On the Revolutions of the Heavenly Spheres. And it would have stayed there. If it was up to Copernicus. Out of fear of criticism, fear of scorn, fear of persecution and possible martyrdom, Copernicus dragged his feet. He resisted publishing his work. But in 1539, a mathematician from Wittenberg, a Lutheran, a colleague of the good doctor himself, named Georg Joachim Rheticus, for a while, became a student of Copernicus. And when he, eventually, went back to Wittenberg, he took the manuscript with him! And with the help of another Lutheran theologian, that manuscript was printed and presented to the world! And because of that, the universe was changed forever! Soooooo, what does that story have to do with Advent? And with Christmas, beyond that? Well, on one hand, nothing! I just like the story! And I like telling it! We forget there was more to the Reformation than what we remember. That there was more, even, than just god! And this is a little piece of that “more.” But, on the other hand, it has everything to do with it. You see, Copernicus wrote that the earth revolved around the sun. But today, nearly five hundred years later, one-in-four Americans STILL believe the earth is the center of the universe. 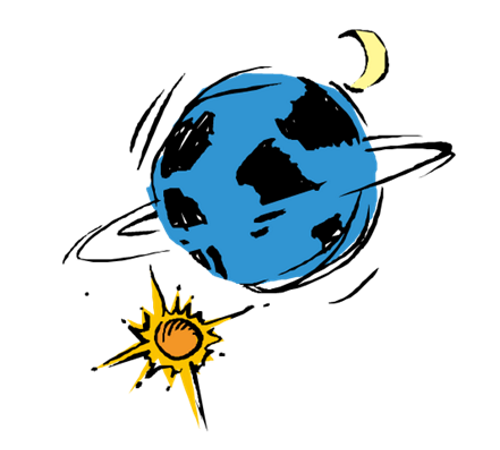 One-in-four Americans, contrary to Copernicus, believes the sun goes around the earth. It all depends on our frame of reference! Here we are spinning like a top at a thousand miles an hour! And it feels like we’re sitting still. Rushing, hurtling, plummeting through space at sixty-seven thousand miles per hour! And it seems like nothing’s moving, at all. That’s how it is for one-in-four of us. The other three? Well, our heads might understand, but we still watch the sun rise each morning and set every evening. It’s all about frame-of-reference! Context! Perspective! Vantagepoint! It’s all relative! And if that’s true for the universe, it’s, definitely, true for this time of year! For the world around us, this is a time of preparation. A season of getting ready. And we’re the ones moving! Christmas stays in one place. Just over the next hill. Just around the next turn. Stationary. Unmoving. If there’s something that has to be done, if there’s something that has to happen, it’s all up to us! We’re the ones to get ‘er done! Deck halls! Don apparel! Troll carols! It’s our responsibility! We’ve got to do it, or it won’t get done! As we get closer and closer to the deadlines, we become more desperate, more panicky, more frantic! Shopping days till Christmas! Lat day to ship packages! Cutoff date for mailing cards! The shepherds go to the manger! The wise men to Bethlehem! It’s as if the whole world is moving! Restlessly! Unstoppably! inevitably! To some cosmic destination! And we’re a part of it all! Day by day! Step by step! Dream by dream by dream! There’s only one problem. That’s not the way the universe works. At least, not the universe of faith or hope or love! We’re not the ones move. God is! God is! We simply sit… and wait… And the drama unfolds right before our eyes! We do nothing! And yet, from our perspective, we think we do it all! We don’t. We don’t help it along. We don’t hurry it up. But it’s all up to god! Father! Spirit! Son! We contribute nothing! The name Jesus means savior. Whoever heard of a savior who never left the tower. But who just waited for the people who needed saving – the lost, the broken – to come to him? It just doesn’t work that way! The way we see it, we come to church! We go to heaven! But we’ve got it all wrong! We’ve got it backwards! Church comes to us! Heaven descends! We don’t draw near to our redemption. Our redemption draws near to us! Even faith – like everything else – comes to us! We don’t come to it! But then, that’s what it means to be saved by grace! We. Don’t. Do. Anything! We simply sit. And we wait. As god does the rest! Look at the songs we sing today! The bridegroom comes! The King Shall Come! Savior of the Nations, Come! Lo! He Comes on Clouds Descending! It’s all about god! Leaving heaven! Coming to us! “True Dawn,” we sang, “with haste comes from on high!” And we do nothing! We say nothing! We just sit. And wait. For the sure and certain advent of our god! We’re not here to earn. We’re not here to deserve. We’re here to receive. And that receiving requires nothing from us! Nothing but our open hands! No wanting-ness! No willingness! No wishing-ness! Nothing more than who we already are! Nothing more than who we have always been! But one out of every four Americans still believe that the sun goes around the earth. And, no doubt, even more believe that we must make our way to god. They’re both wrong. The earth goes around the sun. And god comes to us! Come to us and makes us god’s very own! But then again, maybe that’s what, that’s who we’ve always been – god’s very own! And maybe god’s coming isn’t so much to make us something different, but merely to open our hearts and our eyes! Open our hearts and eyes to god! Open our hearts and eyes to one another! But either way, it’s still not us to us! Ours to accomplish! Ours to achieve! My friends, we sit. And we wait. And god does the rest! We sit. And we wait. And god does it all!